It seems there is nothing wrong with the above sentence. Rome as one of the greatest civilizations in the world has given so much influence to the world to this day. With beautiful palace buildings, gothic churches, ancient basilicas, ancient Roman monuments, sculptures, and fountains, all this is a special attraction for Rome in Italy. Rome, as one of the eternal towns in Italy, is best suited to be the best tourist destination as it is rich in historical heritage with the cosmopolitan atmosphere. Want to know what sights in Rome, Italy to visit? Here's a list of 10 sights in Rome, Italy that you should visit. Campo de 'Fiori is a rectangular area south of Piazza Navona used as a market during the day and is used as a party for students and tourists at night. The meaning of the name of this place is "Field of Flowers" which was first given in the middle ages when the condition of this area is still a pasture. Every day (except Sundays), during the day this location is a market where people sell vegetables. The locals can find fresh food products such as fish, meat, vegetables, and spices here. 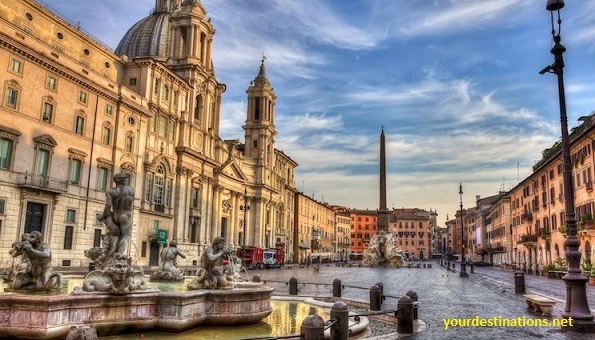 Piazza Navona is one of the most famous buildings in Rome. Piazza Navona was established towards the end of the 15th century while maintaining the shape of the Stadium of Domitian that once stood here. Built by Emperor Domitianus in AD 86, the stadium has a larger arena than the Colosseum and is often used as the location of various festivals or sporting events. The surrounding buildings are square, where the spectators sit. The main attractions of Piazza Navona are the trio of fountains that adorn the square, the largest being Fontana dei Quattro Fiumi, built between 1647 and 1651 at the request of Pope Innocent X.
Castel Sant'Angelo was originally the tomb of Emperor Hadrian built between 135 and 139 AD. This building was used as a prison until 1870 but now functioned as a museum. As one of the tourist destinations from all over the world, this resort is open every Tuesday to Sunday, from 9.00 am to 6.30 pm. Unfortunately, at Christmas and New Year, this place is not open to the public. The Roman Forum is located in a small valley between the Palatine and Capitoline Hills. The Roman Forum itself has stood for centuries and is full of historical value because this place is the political, administrative and religious center of Rome. Here, there are the oldest and most important sites in Rome. Each year, Italian tourist attractions known as the most famous meeting place in the world throughout history is able to attract 4.5 million tourists from all over the world. The Spanish Steps are a truly monumental staircase consisting of 135 steps. The staircase was built with funds from France in 1721-1725 to connect between the Spanish Bourbon Embassy and Trinita dei Monti Church under the patronage of the Bourbon kings of France. This ladder was designed by architects Francesco de Sanctis and Alessandro Specchi. Tourist attractions in Italy are also often used as a place of filming, one of which is the Hollywood movie The Man From UNCLE. Done built in 1762 by Nicola Salvi, Trevi is renowned as a Baroque fountain with the mythological composition of Neptune's statue, the sea god flanked by two Tritons. Built with a height of 26.3 meters and 49.15 meters wide, this fountain has often been included in some famous Hollywood movies. It is said that anyone who throws a coin into this fountain with his right hand on his left shoulder can return to Rome one day. Coins worth about 3,000 Euros are tossed into this fountain every day. The coins contained in this fountain are used to subsidize the supermarkets in Rome who need help. But unfortunately, sometimes these large quantities of coins are stolen by irresponsible people. Founded by Pope Julius II in the 6th century, the Vatican Museum located within the Vatican City offers some of the world's most important legacies. Interesting things you can find in this museum include the spiral staircase, Raphael's room, and the beautiful Sistine Chapel. Under the patronage of Pope Julius II, the chapel ceiling was painted by Michelangelo in 1508 to 1512. In 2013, within a year the museum was visited by more than 5.5 million tourists from all over the world. The Pantheon is one of the Roman buildings that is kept intact until now. The place that has functioned as a Roman Catholic Church since the 7th century was originally built in 126 AD as a temple for all Roman gods. The Pantheon consists of a large circular super-shaped building with three Corinthian granite ranks. This porch has a concrete dome with a central opening (oculus) to the sky. Pantheon has been around 2,000 years old and still stands majestically until now. The Colosseum is Rome's largest and most famous building making it the most popular and bustling tourist spot in Rome, Italy. The construction of the Colosseum was started by Emperor Vespasian of the Flavian dynasty in 72 AD and completed by his son, Titus in 80 AD. The place is able to accommodate about 50,000 spectators has 80 doors so visitors can easily enter this fantastic building. Today, the Colosseum is a major tourist attraction in Rome that is visited by thousands of tourists every day. Well, that's a recommendation review of tourist attractions in the Roma, Italia that must be visited from Yourdestinations.net. Which tourist attractions are most interesting to you? Share, please!